Two Houston lawyers have filed suit against Ford, charging that a defective cruise-control module ignited fires that destroyed their clients' vehicles and the home of a Galveston family. Ford is recalling about 800,000 2000-model F-150 trucks, Expedition and Navigator SUVs because of the problem. The suit charges that fire investigators determined the 2002 Galveston house fire started inside a 1997 Ford F-150 pickup that was parked under the beachfront home. Its engine was turned off at the time of the fire, which began without warning. That is typical of the pattern surrounding many of the fires in Ford F-150 and related vehicles. "The majority of the fires happened when the car is not in use and the vehicle is turned off. The reason it catches fire is because it's hot-wired like an onboard computer or clock. It has a hot line going to it 24/7," Houston-area attorney Norman Jolly told Houston's KPRC-TV. Jolly said all the cases he's representing are Ford F-Series trucks of different years, up to and including 2000 models. He also said the vehicles were not in use when the explosion occurred. Jolly is suing Ford on behalf of Charles Everts, whose pickup caught on fire because of the switch, which burned his Tiki Island home to the ground. "My 1997 Ford XLT Lariat pickup after being turned off for several hours while parked under my home in Tiki Island caught fire and totally destroyed my home and all me and my wife owned," Everts said in a complaint to ConsumerAffairs.com. "Killed one dog but my Labrador Sarah was able to leap over our deck railing and down 20 feet into a canal saving her life." "Thank God we were not at home when the fired occurred or I would not be able to write this letter," he said. Another plaintiff in the suit, Marley Garcia, said he woke up to a popping noise from his garage and found his Ford Expedition in flames. The ceiling os his garage was already on fire as he began pushing the vehicle outside, he said. "I knew if (the vehicle) burned any more, it would burn my house down and kill me and my family," Garcia told the station. "I don't know how I did it. I couldn't see anything either. Everything was just black. I was going by feel." Despite numerous incidents in older vehicles, Ford and NHTSA are concentrating their investigation and the recall on 2000-year models. Jolly told the station that the NHTSA's investigation is currently only investigating problems with the recalled vehicles even though they have received complaints on older model Ford trucks and SUVs. "We can see, clearly, the fire in this 2000 Expedition was starting right there in the switch -- the same switch that's installed on numerous Ford vehicles," Jolly said. Giant insurance broker Marsh & McLennan has agreed to pay $850 million in restitution to policyholders harmed by its actions and adopt a new business model that avoids similar conflicts of interest. Marsh also apologized for its "unlawful" and "shameful" conduct. "To its credit, Marsh is not disputing the problems identified in our original complaint," New York Attorney General Eliot Spitzer said. "Instead, the company has embraced restitution and reform as a way of making a clean break from the practices that misled and harmed its clients in the past." The agreement comes after Spitzer's office filed a complaint and the New York State Insurance Department filed citations in October alleging that Marsh steered its clients to insurers with which it had lucrative payoff agreements, and that the firm solicited rigged bids for insurance contracts. Under the settlement agreement, Marsh will pay $850 million over four years into a fund from which clients will be compensated. The company will work with the Attorney General's office and the Insurance Department to encourage clients to participate in the fund and to administer it nationwide. In addition, the company will adopt stringent reforms, including an agreement to limit its insurance brokerage compensation to a single fee or commission at the time of placement, a ban on contingent commissions, and a requirement that all forms of compensation will be disclosed to and approved by Marsh's clients. "These landmark reforms will help protect against conflicts of interest and help restore the integrity of the entire insurance industry, if followed by other firms," Spitzer said, noting that the reforms go beyond the model guidelines issued recently by the National Association of Insurance Commissioners. According to Spitzer's original complaint, Marsh collected approximately $800 million in contingent commissions in 2003. The complaint alleged that those commissions were tainted by conflicts that harmed Marsh's customers -- large corporations, small and mid-size businesses, municipal governments, school districts and some individuals. In the last three months, six insurance executives from three companies have pleaded guilty to criminal charges related to the scheme. The joint investigation by Attorney General's office and Insurance Department is continuing. ACORN, the Association of Community Organizations for Reform Now, is opening free tax preparation centers in 45 cities around the U.S. that will help low- and moderate-income families file their taxes and receive their refunds quickly. ACORN is also stepping up its campaign against rapid refund loans. ACORN said it expects to help thousands of low-income families file their taxes and claim the Earned Income Tax Credit (EITC) and child tax credits that they have earned. Organized in partnership with the IRS Volunteer Income Tax Assistance (VITA) program, the ACORN Free Tax Preparation Centers can electronically file current year taxes and provide fast refunds for those taxpayers who would like their refunds direct-deposited into their bank account, usually in as few as ten days. The ACORN Free Tax Preparation Centers will also help more low-income families claim the Earned Income Tax Credit (EITC) through door-to-door outreach in low- and moderate-income neighborhoods. The EITC, which can provide families with up to $4,300 in tax credits each year, is the federal governments most successful antipoverty program. Almost a quarter of all EITC eligible families do not claim their credit every year amounting to more than 7 million families who could be missing out on over $12 billion in tax benefits. We are out to change that, said ACORN National President Maude Hurd. For locations of ACORN Free Tax Preparation Centers, see www.taxprep.acorn.org. H&R Block and ACORN are launching a partnership that will include: outreach in 65 cities to educate families that they may be eligible for the EITC; enhanced disclosure to customers by H&R Block about the costs and speed of refund options; and elimination of the systems administration fee connected with refund loans sold by H&R Block. Since last tax season ACORN has been engaged in an aggressive campaign to force Jackson-Hewitt, the nation's second largest tax preparer, to improve its practices related to sales of refund loans and other high-cost bank products. The campaign has involved protests, picketing and flyering in front of Jackson-Hewitt offices throughout the country. On January 11, ACORN announced that it was suspending protests because Jackson-Hewitt had entered into serious negotiations with ACORN. The company has already agreed to eliminate the application fees they charge customers for a RAL and other products in 50 of its markets starting this tax season, and in all of its markets the company has improved the disclosures they give customers. ACORN has launched launched a campaign aimed at Liberty Tax, the third largest tax preparer in the country. Liberty Tax has 1800 offices in 48 states and Canada, and is the fastest growing tax service ever with annual revenues rising from $6.4 million in 2001 to $42.4 million in 2004. The Internal Revenue Service has a new Web-based tool to help working families determine if they are eligible for the Earned Income Tax Credit. The EITC Assistant will help take the guess work out of the EITC eligibility rules. The EITC Assistant is one in a series of steps taken by the IRS to encourage all eligible taxpayers to claim the EITC refund. For the 2004 tax year, the maximum credit is $4,300, which helps lift millions of families out of poverty. The new EITC Assistant also reflects all the tax law changes, including new income limits for eligibility as well as the optional use of nontaxable combat pay for use in refund calculations. EITC Assistant is available in English and Spanish at IRS.gov. The EITC Assistant also can be used by individuals, tax practitioners, employers, community and public service organizations and IRS partners. By answering a few simple questions and providing some basic income information, the program will assist taxpayers in determining their correct filing status, determining whether their children met the tests for a qualifying child and estimate the amount of credit that taxpayers may receive. The IRS also is expanding a pilot project to reach out to taxpayers with limited English proficiency. Grassroots outreach efforts in Miami and Los Angeles last year will be expanded to include Chicago and Houston this year. The IRS will host a series of events in those four cities to help families file their federal tax returns. The Earned Income Tax Credit is a refundable federal income tax credit for low-income working individuals and families. Congress originally approved the tax credit legislation in 1975 in part to offset the burden of social security taxes and to provide an incentive to work. Initial estimates for 2004 show approximately 22 million low-income families received about $38 billion. To qualify, taxpayers must meet certain requirements and file a tax return, even if they did not earn enough money to be obligated to file a tax return. The amount of the credit is determined by earned income and the number of children in the household. IRS Publication 596, available in English and Spanish, outlines eligibility requirements for EITC and highlights tax law changes. Taxpayers also can find the eligibility rules in Fact Sheet 05-10 and through 1040 Central on IRS.gov. For example, in the 2004 tax year, individuals without qualifying children must earn less than $11,490 ($12,490 if married filing jointly); individuals with one child must earn less than $30,338 ($31,338 if married filing jointly) and individuals with more than one child must earn less than $34,458 ($35,458 if married filing jointly). Congress also enacted a special provision for military families with combat pay. Combat pay is not taxable. However, families have the option of using combat pay to calculate their EITC refund (and the child tax credit) if it helps maximize the refund. Be aware that either all or none of the combat pay must be used in the calculation. Taxpayers cannot use part of their combat pay to enhance their refund. Again, the EITC Assistant will help taxpayers determine if use of their combat pay will help them qualify for a larger tax credit. EITC rules can be complex, but help is available if you need it, said David R. Williams, EITC director. The IRS works with 265 community coalitions, helps train thousands of volunteer tax preparers and works with tax preparation software companies to provide free software and electronic filing to millions of EITC recipients. EITC claimants should also review Free File on IRS.gov for access to free software and e-filing for federal tax returns. Taxpayers are under no obligation to purchase other services from the companies. Working families who often need a fast refund should consider using electronic filing and direct deposit of their refund. They can receive their refund in half the time of a paper return. The EITC Assistant is a convenient way to help you find out if you qualify for this important benefit, said IRS Commissioner Mark W. Everson. This tool will help take the guess work out of EITC. Ford has announced a safety recall for a part that could cause fires underneath the hoods of several popular Ford pickup trucks and SUVs. But consumer advocates and lawyers representing several Texans whose vehicles were destroyed say the problem extends beyond the models recalled. Ford says it will notify nearly 800,000 owners of the recalled vehicles at the beginning of February via postal mail. Owners can also contact the company's Customer Assistance Center at (800) 392-3673. The recall involves 2000 model F-150 pickup trucks, Expeditions and Navigators, and 2001 model F-series Supercrew pickup trucks equipped with cruise control, the release said. The recall involves problems with the electrical connector to the cruise control feature. Ford is encouraging vehicle owners to have the cruise-control switches deactivated. The company is gathering replacement parts that will be the subject of a second notification to owners. Neither Ford nor NHTSA made any mention of similar problems in other model years, even though consumer organizations, the news media and NHTSA have received numerous complaints of similar fires in vehicles not covered in the recall. Owners who have experienced similar vehicle fires should report them to the National Highway Traffic Safety Administration at (888) 327-4236 or via their Web site at www.nhtsa.dot.gov and to ConsumerAffairs.com. Food and Drug Administration safety reviewer David Graham estimates that Merck's Vioxx may have caused as many as 140,000 heart attacks in the U.S. before it was withdrawn last September. His estimate was published in the British medical journal Lancet. The study was based on records of 1.4 million members of Kaiser Permanente, the largest U.S. nonprofit insurer, with 6 million members in California. Many of the cases may have been fatal, Graham said. A Merck spokesman said the estimate of harm from Vioxx was "speculation." Determinations of Vioxx's potential role in patients' cardiovascular problems "can only be made on a case by case basis," he said. The publication of Graham's findings is expected to intensify the drug-safety debate that has swept Washington since the Vioxx withdrawal. Graham and other critics accuse the FDA of being too slow to ban or tighten regulations on medicines that cause serious side effects. Researchers compared the incidence of heart attacks and sudden cardiac death for patients taking Vioxx with those on Pfizer's Celebrex, a similar painkiller, and over-the-counter medications. Applying the findings across the U.S. population, "We arrived at the estimate of 88,000 to 140,000 patients that had a heart attack in the U.S. because they used Vioxx" after it was introduced in in 1999, Graham said. Portions of the study had been disclosed earlier. Graham said in Nov. 18 testimony before the Senate Finance Committee that between 88,000 and 139,000 heart attacks may have been linked to Vioxx. Merck withdrew Vioxx after a company study showed that patients taking it for 18 months or longer had twice the risk of heart attacks and strokes -- 1.5 percent -- as those taking a placebo. Graham said his bosses at the FDA at one point threatened to fire him as associate director for science and medicine in the agency's Office of Drug Safety if he published the findings. The study found that Vioxx, given at the standard dose, increases the risk of heart attack by about 50 percent, compared with Pfizer's Celebrex, and more than triples the risk of heart attacks when given at high doses. The two drugs suppress the body's production of the Cox-2 enzyme, which is linked to pain and swelling. People taking Vioxx had a 34 percent higher chance of heart disease compared with those taking other painkillers including Celebrex, naproxen and ibuprofen, the study found. Patients taking naproxen, a generic painkiller sold as Aleve by Bayer AG, had a 14 percent increase in heart risk compared with some other painkillers such as ibuprofen, the study showed. Previous trials had suggested naproxen may protect against cardiac disease. Commend Co. is recalling about 600 of its HD Designs 5-piece Dining Sets. The wooden chairs can break, posing a fall hazard to consumers. Commend has received one report of a chair breaking. In this report, there was a fall and minor injury. The chairs and table are sold unassembled as part of a boxed 5-piece dining set. The words HD Designs 5 Piece Dining Set and item number BFR3917HO are written on the box. The chairs and dining table are honey oak wood and the seats have beige vinyl padding. The chairs were sold at: Fred Meyer stores in Idaho, Washington, Oregon and Alaska; Frys stores in Arizona; and Smiths Marketplace stores in Utah from April 2004 to October 2004 for about $200. Consumers should immediately stop using the product and contact Fred Meyer to receive a store credit. Consumer Contact: For more information, call Fred Meyer at (800) 697-2448 between 6 a.m. and 6 p.m. PT Monday through Friday or visit the Fred Meyer Web site at www.fredmeyer.com. Lakewood Co. is recalling about 70,000 of its Model 5101 oil-filled electric radiator heater. Welds can rupture, expelling hot oil that can burn nearby consumers. Lakewood is aware of 28 reports of incidents, including one burn injury from spewing oil. An additional 14 heaters with ruptured welds have been returned to Lakewood. 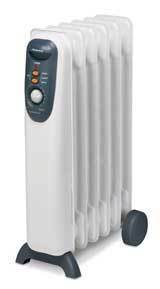 The recalled heaters are portable electric radiator-style heaters with six fins, one of which has the control panel attached to it. The units are grayish-white in color and have the name Lakewood printed below the handle indentation on the control panel. The model number 5101 is printed on the UL label on the lower right side of the control panel. The heaters were sold at retailers nationwide, including Wal-Mart and Ace Hardware, from August 2004 through November 13, 2004 for between $34 and $40. Consumers should immediately stop using these heaters, unplug them and contact Lakewood to determine if their heater is part of the recall. Lakewood will provide a free replacement heater to each consumer who has a recalled heater. Consumer Contact: Call Lakewood toll-free at (888) 858-3506 between 8:30 a.m. and 5 p.m. CT Monday through Friday or visit the companys Web site at www.lakewoodeng.com. Clinical trials have sounded alarm bells for another promising new drug, this one to treat Alzheimer's patients. After consulting with Food and Drug Administration regulators, Johnson & Johnson said the safety of its drug Reminyl is now under review. Reminyl is currently approved in 69 countries worldwide for treatment of mild to moderate Alzheimer's disease. No regulatory applications have been submitted for the potential use of the drug for the treatment of mild cognitive impairment anywhere in the world, and the company said none are planned. Johnson & Johnson said the review was initiated as a result of a preliminary safety assessment of an imbalance of mortality in two mild cognitive impairment clinical trials submitted to health authorities worldwide by Johnson & Johnson Pharmaceutical Research & Development, L.L.C., in August 2004. The clinical trial results also were presented last year at two international scientific forums: the International Congress of Alzheimer's Disease (ICAD) and the Alzheimer's Association Research Roundtable Mild Cognitive Impairment Meeting. Approximately 2,000 patients from 16 countries were enrolled in the GAL-INT-11 and GAL-INT-18 studies, which were designed to evaluate a potential decrease in the rate of progression from mild cognitive impairment to dementia in subjects treated with the drug. In the two-year trials, the company says 15 patients taking Reminyl died, compared with five who were taking a placebo. Not all causes of death were the same, but apparently enough were attributed to heart attacks or strokes to cause concern and trigger a review. It was a series of clinical trials that caused new concerns about the safety of COX-2 inhibitors prescribed to treat arthritis. Merck voluntarily withdrew Vioxx while Pfizer has suspended advertising for Celebrex and Bextra. In those cases, clinical trials pointed to an increase risk of heart attack or stroke for people taking the drugs. Johnson & Johnson said mortality rates were low in both the Reminyl and placebo groups in the two-year study compared to expected rates in this population or in patients with Alzheimer's disease. The clinical trials, it said, showed a higher relative mortality rate in patients with mild cognitive impairment treated with Reminyl than in patients treated with placebo. The company said it is currently analyzing additional data from these studies, including information retrieved from subjects who had dropped out of the trials, and is discussing the results with regulatory authorities. Their business plans differ in many ways, but there's one area where major airlines and their cut-rate competitors agree: maintenance is a lot cheaper when it's performed by lower-paid mechanics working for outsourcers. JetBlue, Southwest, America West, Northwest and United are among the carriers who outsource major maintenance of their aircraft to contractors in other countries, according to a report in The Wall Street Journal. • Bankrupt United Airlines recently won union approval to begin using outside contractors for heavy maintenance. It wasn't long ago that major airlines employed their own highly-skilled mechanics, each with his or her own Federal Aviation Administration license. The mechanics, who often studied for two years before taking the test, could make $60 or more per hour. Mechanics working for outsourcers don't have to be licensed. Only supervisors are required to hold FAA licenses and are responsible for oversight of the mechanics, who in countries like El Salvador may make $10 to $20 per hour. Is this endangering long-term safety of the U.S. commercial fleet? The airlines say no but others aren't sure. Last year, investigators found that deficient maintenance by an outside vendor was partly to blame for the 2003 crash of a commuter flight in Charlotte, N.C. that killed 21 people. In 1999, ValuJet flight 592 crashed into the Florida Everglades after taking off from Miami International Airport, killing all 110 on board. The crash was attributed to oxygen canisters improperly stowed in the aircraft's hold by maintenance employees working for an outside contractor. In 2003, the Department of Transportation's Inspector General said the FAA was inadequately supervising outside contractors while devoting too many of its resources to oversight of in-house maintenance operations. Airline spokesmen contend that the overseas maintenance contractors are more tightly supervised than the airlines' own mechanics. After all, the argument goes, they work on aircraft from airlines around the world and are subject to supervision by major European and Asian governments. American Airlines says it prefers to keep heavy maintenance in-house because it has a well-trained, highly seasoned workforce. It outsources only 20% of its maintenance and none of its heavy tear-downs. British researchers warn that cell phone use can produce brain tumors, and they're taking the additional step of warning parents that children under age eight should not use mobile phones. Their report says heavy use can lead to tumors in the brain and ears, and further states that up until now, the risk has largely been understated by most scientists. Concerns about cell phone use triggering tumors are nothing new. In fact they are almost as old as the industry itself. But as mobile phones have become ubiquitous is modern culture world-wide, the level of concern is rising. A study in the international journal Epidemiology in October last year found that people who have used cell phones for at least 10 years may have an increased risk of developing a rare brain tumor. Professor Sir William Stewart, chairman of the National Radiological Protection Board (NRPB), said the warnings are more serious now because the evidence of potentially harmful effects have become more persuasive over the last five years. He and his colleagues argue that four studies in particular have caused growing concern. • A ten-year study in Sweden suggests that heavy mobile users are more prone to non-malignant tumours in the ear and brain. • A Dutch study suggests heavy mobile phone use produces changes in cognitive function. • A German study suggests living near a mobile telephone base station increases this risk of cancer. • A project supported by the EU had shown evidence of cell damage from fields typical of those of mobile phones. In the United States, the wireless industry supports further research but insists all available research says it's safe to use cell phones. The Cellular Communications and Internet Association carries several quotes to that effect on its Web site. However, the most recent is from a March 2002 study by the Food and Drug Administration that concludes "available scientific evidence does not show that any health problems are associated with using wireless phones." Norco Products is recalling about 80,000 Adams Trail-a-Bike and Adams Slipstream Bicycle Attachment units. The hardware used in the assembly of the universal hitch may come loose causing the unit to separate from the lead bicycle, which could lead to a serious or fatal injury to the rider of the bicycle attachment. Norco Products has received two reports of hardware falling out of the hitch assembly. One minor injury reported. The recall involves the Adams Trail-A-Bike or Adams Slipstream sold under the following models: Starter, Folder, Shifter, Shocker, Ultimate Tandem, Deluxe Folder, Me 2 and Original. Trail-A-Bike or Slipstream is printed on the top tube of the bicycle attachment and Adams is printed on the chain guard. The product resembles a childrens bicycle without a front wheel and has an elongated top tube that stretches to attach to the seat post of an adult bicycle, creating a tandem. The product was sold for use by children ages 4 to 7. The attachments were sold at independent bicycle stores nationwide from January 1996 through October 2004 for between $125 to $295. Consumers should immediately stop using the product and contact their local bicycle dealer to arrange for an inspection and to receive a no charge repair kit to be installed for free. Mid-Minnesota Legal Assistance and the Minnesota Attorney General's Office have filed lawsuits against Messerli & Kramer, a Twin Cities law firm, accusing it of using unlawful and bad faith tactics to collect debts from Minnesota consumers. "This firm specializes in obtaining default judgments, often against the poor, sick, and disabled," said Tim Thompson, Litigation Director at Mid-Minnesota Legal Assistance. "That's not illegal. But what is illegal is adding to the misery by piling their own attorney fees on to these judgments without following Minnesota law. They even bill for time they haven't spent on the case." "It is wrong for collection attorneys to use their knowledge of the system to make unlawful gains," said Attorney General Mike Hatch. "Garnishing wages such as Social Security, veterans' benefits, or other exempted incomes, when the law states otherwise, is inappropriate and in bad faith." Both lawsuits allege that M&K improperly adds unearned, or "future," attorneys' fees to the debts owed by consumers when M&K obtains default judgments, adding hundreds or thousands of dollars to the amount of the bill. They also claim that M&K files boilerplate affidavits in Minnesota district courts seeking attorneys' fees for work that has not yet been performed. M&K's boilerplate affidavits request 15% of the principal balance (up to $3,000), which includes attorneys' fees that it estimates it will incur in the future. According to the lawsuits, M&K's practices violate Minnesota law, which outlines the requirements to obtain an award of attorneys' fees in connection with a default judgment. Minnesota statutes do not include awards for unearned or "future" work. The Attorney General's lawsuit also alleges that M&K's collection attorneys have garnished in bad faith accounts of vulnerable consumers who live on limited or fixed incomes. Under Minnesota law, creditors can collect debts by garnishing debtors' bank accounts. Minnesota law, however, provides that certain earnings are exempt from garnishment, including income from Social Security, veterans' benefits, disability, or other protected sources. M&K's collection attorneys attach bank accounts, garnishing exempted funds, thereby shifting the burden to the consumer to file a notice of exemption claiming that the funds are exempt from garnishment. The Attorney General's lawsuit alleges that M&K used the garnishment process in bad faith. Among other things, instead of releasing levies where appropriate, the lawsuit alleges that M&K's collection attorneys objected to consumers' exemption claims, often without a good faith basis for doing so, thereby forcing consumers to file court documents to prove that the funds are exempt. The lawsuit alleges that, in some cases where consumers requested a hearing to determine the validity of an exemption, M&K's attorneys either failed to show up, conceded the case at the hearing, or a court found that the funds were, in fact, exempt from garnishment. Consumers in such cases lost access to their money for weeks because their accounts were frozen by M&K's initial levy. The Attorney General's lawsuit alleges that, in some instances, M&K garnished consumers' income even after the consumer had shown a valid exemption from garnishment. This is not the first time M&K's collection attorneys have been involved in disputes over aggressive debt collection tactics. For instance, a collections case filed in Anoka County District Court by M&K was dismissed when the judge found that the default judgment was "entered in error and as a result of the false statements contained in the affidavit of plaintiff's attorney (M&K)." Last month, the Minnesota Court of Appeals noted the "gravity" of actions by an M&K collection attorney who falsely told the court that a Minnesota consumer had never denied that he owed a debt to the credit card company represented by M&K. Like other disasters, the Christmas Week tsunami will be followed by charity scams designed to separate generous consumers from their money. Florida Agriculture and Consumer Services Commissioner Charles H. Bronson is among those warning the public to beware of potential scam artists posing as relief agencies for the victims of the tsunami in Asia. "It's clear that there will be a great need for assistance for the tens of thousands of victims of this terrible disaster," Bronson said. "But people who want to help need to ensure their donations are going to actual victims and not to con artists." Bronson's department has received reports in past disasters, such as wildfires and following the 9/11 terrorist attacks, of organizations seeking help for victims and pocketing the money. It's difficult to investigate these cases because scam artists are usually gone from an area before anyone realizes they've been conned. So Bronson says it's incumbent on consumers to take precautions to avoid being victimized. Consumers may be approached over the phone, on the Internet or through direct mail. • Don't judge an organization based on an impressive sounding name. Find out what it actually does. • Be wary of emotional appeals and organizations that have only vague plans for spending the funds they collect. • Never give cash. Write a check payable only to an organization --not an individual. • Be wary of organizations that offer to send a 'runner' to pick up your donation. Reputable charities are willing to wait for your contribution. • Consumers have the right to ask for an organization's financial report and its federal tax identification number-the latter of which you'll need to claim your contribution as a tax deduction.